Ebony Lodge has a commanding presence and an essence that evokes an intense feeling of familiarity - as if visiting a congenial family home. Sumptuous coziness is simply the order of the day - tempting you into relaxation and reflection. 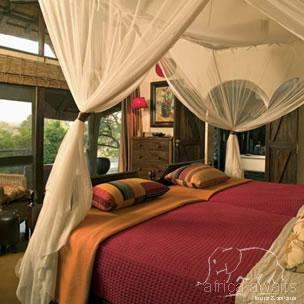 12 luxurious suites (24 beds). Two of the suites are double family suites. Each luxury air-conditioned suite consists of sumptuous bathrooms, indoor and outdoor showers, and an expansive living area with double-sided fireplace, mini bar and fridge and private wooden leisure decks with a heated private plunge pool. All the suites have direct dial telephones, and the library has two computers and direct internet links. 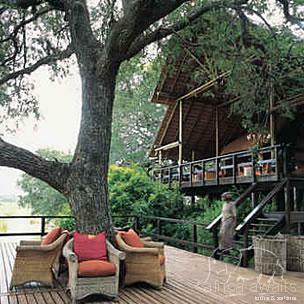 The main lodge has lounge and timber deck dining areas overlooking the Sand River, a bar area and traditional open boma, gymnasium, health spa, library and wine cellar. Other available services at Ebony Lodge include Community tours into neighbouring villages. Shopping at the Singita Shop stocks a range of African artifacts and curios. Premier Wine Boutique. A spa complete with a fully-equipped gym. A swimming pool at the main lodge. Internet and fax facilities, and a well-stocked library. 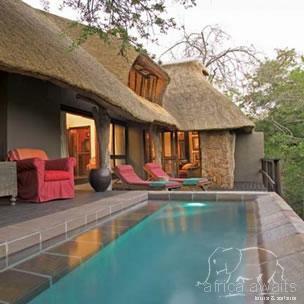 With your holiday, safari or business trip from in to Singita Ebony in Kruger National Park.